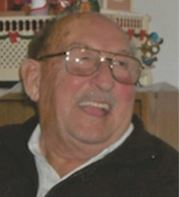 LEWISTON - Roger J.P. Bosse, 86, of 47 Coburn St., Lewiston, died Saturday Jan. 12, 2019. LEWISTON – Roger J.P. Bosse, 86, of 47 Coburn St., Lewiston, died Saturday Jan. 12, 2019, at d”Youville Rehab from a long battle with cancer with his family by his side. Roger was born Dec. 30, 1932, in Lewiston to Camille and Rejeanne Bosse. He attended St. Peters School and St. Dominic’s High School. Following high school Roger enlisted in the army where he was stationed in Korea. He returned home where he worked locally at Jolly Post, Falcon Shoe and retired from Michaud Distributors in 2005. Roger enjoyed boating, bowling, hunting and watching hockey on TV. Most days you would find him sitting in his red rocker at the table reading the paper or in his living room watching his favorite reruns of old western movies. Roger mostly enjoyed sitting on his back porch drinking his one Budweiser with his family and friends. Roger is survived by his brother Real Bosse and wife Pauline. He also left behind many nieces and nephews, Steve, Dave, John, Cindy, Sue, Gerry, Kathy, Ann, Andy, Mike, Diane, and Lise. Roger was predeceased by his parents; sister Claudette and brother Gerard. Per Rogers wishes there will be no funeral or services. The family would like to thank the nurses and CNA’s at d’Youville 1 east for their kindness and care during such a difficult time.